Published: Sept. 23, 2018 at 04:16 p.m. 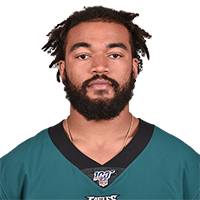 Published: Jan. 21, 2018 at 07:59 p.m.
Philadelphia Eagles defensive end Derek Barnett strip-sacks Minnesota Vikings quarterback Case Keenum and Philadelphia Eagles defensive end Chris Long hops on the recovery. Published: Dec. 26, 2017 at 12:09 a.m.